Have You Noticed That There Are A Whole Lot More Mosquitoes After It Rains? Have you taken note that there are more mosquitoes near marshes and swamps? This is because mosquitoes breed in still or stagnant water. They begin as eggs, but this stage of development only lasts 24 to 48 hours. The next stage of development is called the larvae stage and it can last from 4 to 14 days. Let's take a look at it. 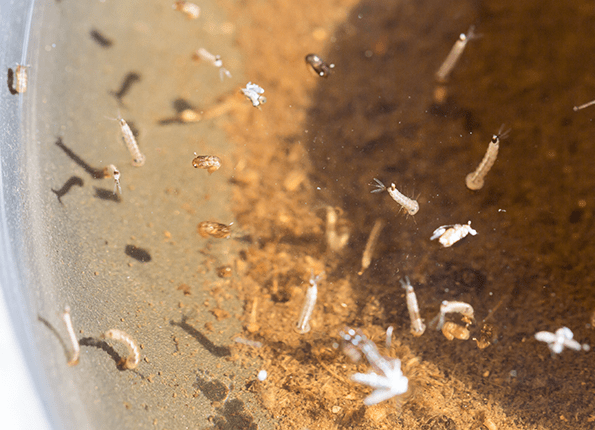 Mosquito larvae, also referred to as wigglers, live in stagnant or still water for days. During this time, they will molt (shed their skin) four times. Each stage of molting is called an instar. During the fourth instar, the mosquito larvae become pupae, and get ready to emerge as breeding, biting, adult mosquitoes. Mosquito larvae are buoyant. Most often they will be found floating on the surface of still water with their heads down. They do this for two reasons. Larvae need to feed almost continually. So, their mouths are always waiting for something small enough to float near. Still and stagnant water is full of simple life forms like algae, plankton, fungi, bacteria, and other microorganisms which give the larvae plenty to eat. They also float on top of the water to get oxygen using a breathing tube, called a siphon, in the way a human might use a snorkel; but unlike a snorkel, this siphon tube can be used to pierce the stems of emergent vegetation to get some of the vital oxygen these baby mosquitoes need to grow into adult mosquitoes. Dips in your lawn that hold water after it rains. Obstructed or broken gutters. When leaves and debris gather, it can cause a still pool to form. These are ideal for mosquito breeding. Toys scattered around in the yard. If a toy sits in one place for more than seven days, it can be long enough for mosquitoes to hatch. Old tires or objects stored in the back of your home. If you tuck a stack of things behind your shed, you may be creating a breeding ground for these pests. Bird pools with still water should be emptied on a routine basis. Tarps are notorious for collecting and holding water, especially if it has been raining frequently. If you have outside flower pots that sit on saucers, those saucers can collect enough water to breed mosquitoes. Open barrels or other containers can hold water in and on them. If you have livestock, water can sometimes collect in water dishes, food dishes, or troughs. Animals can also pack the earth and create spots for rainwater to remain. Keep your animal pens as dry as possible. Some plants have leaves that collect enough water for mosquitoes to use for breeding. As you can see, mosquitoes don't happen overnight. It can take days, even weeks, for adult mosquitoes to form. That is why mosquito abatement services work to reduce mosquito populations and deter the spread of mosquito-borne viruses. Mosquito abatement doesn't just control larvae, it kills mosquitoes at all stages of development, including adults. Mosquito treatments from Action Pest Control kill eggs, larvae, pupas hiding in your grass, and adult mosquitoes hiding from the midday sun in your bushes and shrubs. For over 50 years, Action Pest Control has been the only firm in the Tri-State area equipped and staffed to handle large-scale mosquito abatement for municipalities throughout Indiana, Kentucky, and Illinois. We provide mosquito reduction and abatement services businesses and homeowners as well. If you would like to be part of the solution that is protecting our families and our communities from deadly and sometimes life-changing mosquito illnesses, contact us and get started today.